Want a marquee tailored to your exact requirements. 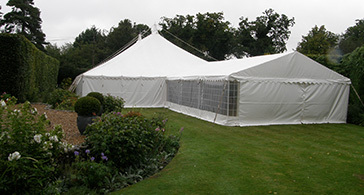 Are you looking for a top quality Marquee in the East Anglia area? The Weatherill Brothers Marquee company has been manufacturing Marquees in East Anglia since the 1950’s and we can custom build any Marquee you require. When you buy one of our Marquees you’re buying years of accumulated knowledge and experience, and that results in a superior product. Our office is manned from 7am, so call us now on 01953 882 394 to discuss your requirements and receive a free same day quote. Our highly skilled and experienced craftsmen make our traditional Marquees out of a breathable cotton canvas fabric that stays cool during the warmest weather. We can also manufacture permanent and semi-permanent ‘traditional style’ Marquees using top quality state of the art PVC materials. This results in a very strong and durable product that can cope with the very worst weather the UK has to offer. Our 60+ years of experience in Marquee manufacture has allowed us to develop systems that work, whatever the conditions. Our fabrics are cut tight and, our roof pitches are low so water doesn’t pool during heavy rain. Our Dutch lacing system and Marquee flaps won’t leak like some other manufacturers designs. Weatherills are also a member of MUTA, the only UK trade association dedicated to marquees, tents and structures, and our Marquees are wind load tested to withstand winds of 80mph.